Is the building above not the coolest thing you have ever seen? 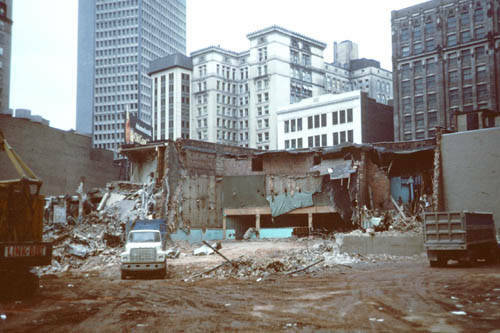 Do you know where this building used to be in Downtown Cleveland? 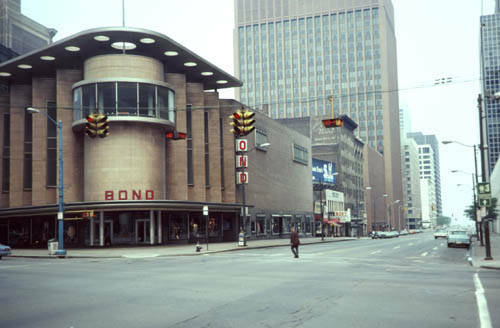 It was one of the last art moderne buildings to reside in the City – it is the home of the Bond Clothing Company. And it was located on the northwest corner of East Ninth and Euclid Avenue (think National City Tower today). The Bond Clothing Company was started in the Hickcox Building on the same corner in the 1920′s. Charles Bond founded the firm and it quickly became the largest retail chain for men’s clothing in the United States and was well known for its two piece suit collection for men. Anyway, the Bond Company decided to tear down the Hickox building in 1946 and erected this beautiful monument soon thereafter. Many stories have been told about the majestic interior including an open terrace and illuminated mirrored columns that extended from the first floor up to the third floor. There was a large curved staircase that allowed patrons to casually walk through the department store and get a great feel about all four floors and the merchandise offered to patrons. I believe that Walker & Weeks was the architect of record. 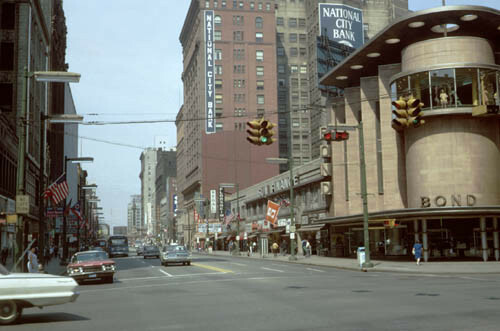 The above photo offers a great view from East Ninth looking west down Euclid Avenue towards Public Square. I love how this street used to look. 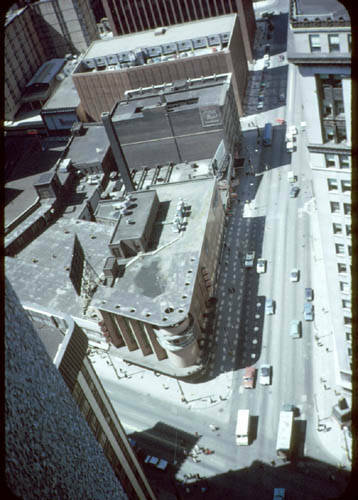 Unfortunately, the store was torn down in 1978 to make way for the National City Tower. This is brilliant architecture. Seems a shame to have lost this to a bland commercial tower. Photo provided courtesy of the Cleveland Press Archives. Former "Tech Czar" for the City of Cleveland, fascinated by the civic space, history (Cleveland & Military), entrepreneurship, social media, food and travel. My first book on Cleveland history will be published by History Press (www.historypress.net) this fall. Attractive young women modeled clothes in the second story rounded window over the intersection of 9th and Euclid during the lunch hour. I started working at that intersection in 1958 and enjoyed a few ‘longer than usual’ lunches to gawk at the models! My mom worked here as a manager on the 2nd floor when I was a child. I remember coming downtown on the bus to visit her with my big sister to go with her to lunch at the Forum Cafeteria. You’re right about the interior–I remember the swoop of the wide staircase up to her small office–the wide stainless steel hand railing and what I would later come to know as Art Deco styling. Very happy to see these pics. They bring back so many memories. I remember it being beautiful but so hard to describe to my wife and children. Oh wow, I remember going to the Forum with my mom when I was a kid. She worked there in the 60s, and my sister and I thought it was the coolest place. I remember it had an automated system for moving trays. The destruction of this beautiful piece of artwork to be replaced by an ugly giant eyesore best describes the stupidity of the major population of Cleveland, Absolutely disgusting, the city should be ashamed, but one has to look no further than the people who have been running this city for decades, complete imbeciles. I would love coming downtown to this store as a teenager! I vaguely remember coming here as a boy in the 1960’s; probably for my Dad to purchase a Sunday suit. I think I may have purchased a suit while in high school at the Great Lakes Mall store.